ThermOmega Tech has released a new solution to the challenge of supplying consistently tepid water on demand for safety showers. 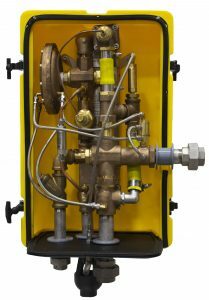 The Therm-O-Mix station uses a facility’s existing steam and water supply to instantaneously deliver tepid water to emergency safety showers and eyewash stations. When an emergency shower or eyewash station is activated, the pressure drop on a diaphragm establishes flow and opens a steam control valve which the station uses to heat the cold water via a heat exchanger.